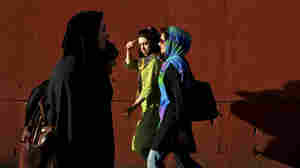 Iran's Culture Wars: Who's Winning These Days? April 12, 2014  Men and women ski on the same slopes. 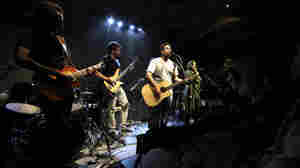 A rock band performs in the capital. It's all part of the constant tug-of-war between religious conservatives and those seeking more social freedoms. March 28, 2014  Iran has been a close ally of Syria for decades and a staunch supporter in Syria's current war. 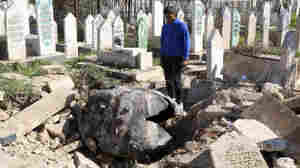 But a growing number of Iranians are questioning the costs of backing President Bashar Assad. March 20, 2014  After bouncing all over the Internet, the iconic photo is coming to big screens in Times Square. 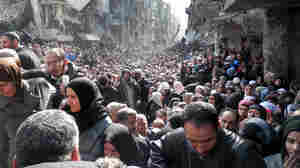 It shows a sea of desperate people waiting for food in the devastated refugee camp of Yarmouk. 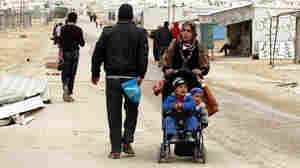 March 17, 2014  Three years into Syria's civil war, a resigned stability and a sense of permanence are taking hold at the Zaatari refugee camp in Jordan. March 17, 2014  The Syrian uprising started three years ago this week with protests and eventually a military crackdown that led to all-out civil war. 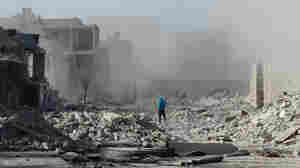 More than 130,000 people have died. March 16, 2014  Convoys of humanitarian aid trucks from Saudi Arabia are rolling through Jordan toward Syria. That puts Jordan in a precarious situation on the front line of the war. 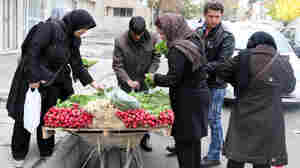 March 15, 2014  Upscale Iranian malls still sell iPads and iPhones and its shops and cafes are stocked and full, but chemical weapons victims have trouble getting medicines and prices for food basics have gone up. March 14, 2014  Samuel Beckett's drama is playing before full houses in the Iranian capital Tehran. Some view it as an allegory of their desire to see change that never seems to come. 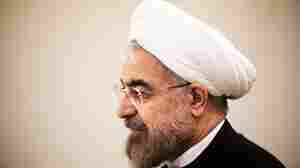 March 5, 2014  A new bloom of activist movements have been spurred by the election of President Hassan Rouhani. And women — many of them educated but without job prospects — are at the forefront. March 3, 2014  NPR's Deborah Amos had a recent run-in with the "morals police" in Tehran. 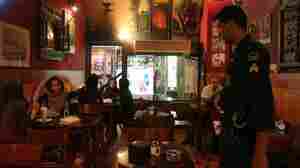 Her three-hour confinement revealed the gap between the enforcers and a generation chafing under strict behavior codes. What Comes Next In Syria? February 1, 2014  More than a week of negotiations in Geneva failed to produce a breakthrough. The two sides may meet again soon, but there's no sign they are capable of establishing a transitional government. Is The U.S. Leaving A Leadership Void In The Middle East? January 30, 2014  Robert Siegel explores the question with NPR's Michele Kelemen and Deb Amos, of whether the United States is disengaging diplomatically from the Middle East and whether that's creating a power void. January 27, 2014  For the first time, the Syrian peace conference brought the rival sides together, while Syria's competing media delegations faced off at even closer range. Pro-government and pro-rebel journalists reported on the same events for the first time, side by side. They sparred, traded insults and even threw some punches in a media war that is as hot as the fighting on the ground. January 24, 2014  Friday was the first day of negotiations at the Syrian peace conference. There were no direct talks, however. Instead, international envoy Lakhdar Brahimi shuttled between government and opposition delegations in separate rooms. January 24, 2014  After the formal opening of the Syria peace conference in the Swiss resort of Montreux, government and opposition representatives begin negotiations Friday at United Nations headquarters in Geneva. International envoy Lakhdar Brahimi is mediating the talks.